Gov. Ned Lamont spoke to reporters after Tuesday’s Bond Commission meeting. Gov. 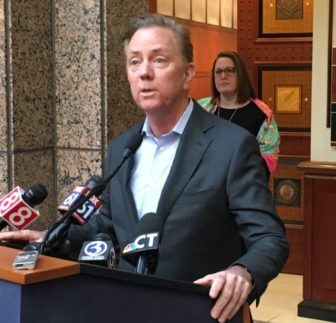 Ned Lamont said Tuesday he is exploring private management of a new public benefit that the Democratic governor has pledged to create this year with the support of labor and over the concerns of business: A paid family and medical leave program financed by a tax on employees. “If I have somebody who wants to administer this thing and take the financial risk in return for a 10-year contract, that’s the way I like to think about these things,” said Lamont, a cable entrepreneur elected last fall.. The Lamont administration and Democratic lawmakers have proposed competing versions of legislation that essentially would create a disability insurance program that would pay workers at least a portion of their wages to care for family members for up to 12 weeks. Negotiations are underway with legislative committee co-chairs and other stakeholders about the variables of such a benefit: How much weeks of wages would be offered? What percentage of wages would be replaced? Who would be eligible? What constitutes a family member? As a form of insurance to be covered by a half-percent payroll tax on employees, those variables must be set before actuaries can assure the governor and legislature of the program’s solvency. The National Federation of Independent Business said the poll offers an incomplete view. Lindsay Farrell, the executive director of the Working Families Party, a union-financed group and part of the coalition backing passage of the bill, said the advocates are skeptical about private management, but their goal is a solid program with benefits generous enough to be useful to lower-paid workers. If the program is not privatized, it would be run by the state Department of Labor. Senate Minority Leader Len Fasano, R-North Haven, has publicly urged the administration to look at private management, but the GOP still was dubious about paid family and medical leave as is currently being considered by Democrats. Correction: As originally posted, this story said the pollster did not ask about the payroll tax.